Let’s talk about Gut Health! When I decided to switch to a Ketogenic Lifestyle, I was hoping to reduce the inflammation in my body. I was on a mission to boost my immune system and reduce the symptoms of my autoimmune conditions. Gut health is a big focus for me because I know how tied it is to my overall health. I started using Just Thrive probiotics and noticed a big difference in my gut’s overall happiness within days. As you probably know our GI tract houses bacteria that contribute to more than just digestion. 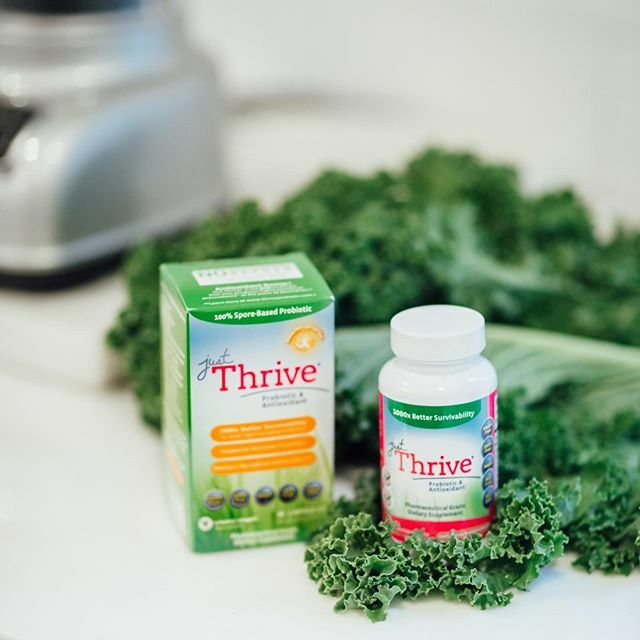 These beneficial bacteria help our bodies digest food and absorb nutrients, produce vitamins and vital nutrients, stimulate healthy immune function, destroy disease-causing microbes, promote healthy skin, and boost our mood and brainpower. Pretty much everyone I know has some sort of GI issue. Environmental toxins, antibiotics, stress, and many other factors can decrease the amount of healthy bacteria in our bodies causing an imbalance. Probiotics are spores of good bacteria that occur naturally in foods or can be taken as a supplement to get your gut balanced. Foods like Yogurt, Kimchi, and Kombucha have natural occurring probiotics. But if you have a bacterial imbalance, a probiotic supplement is your best bet. I’ve recently discovered the brand Just Thrive. Their probiotics have a better survivability than those found in yogurt and other brands. This means that the good bacteria will stay alive long enough to get all the way into your GI tract where it can do the most good. Their products are vegan and Keto friendly. And they have a 100% money back guarantee. Just Thrive probiotics contains a unique blend of four probiotic spores that have been strategically designed to give you the most health benefits. 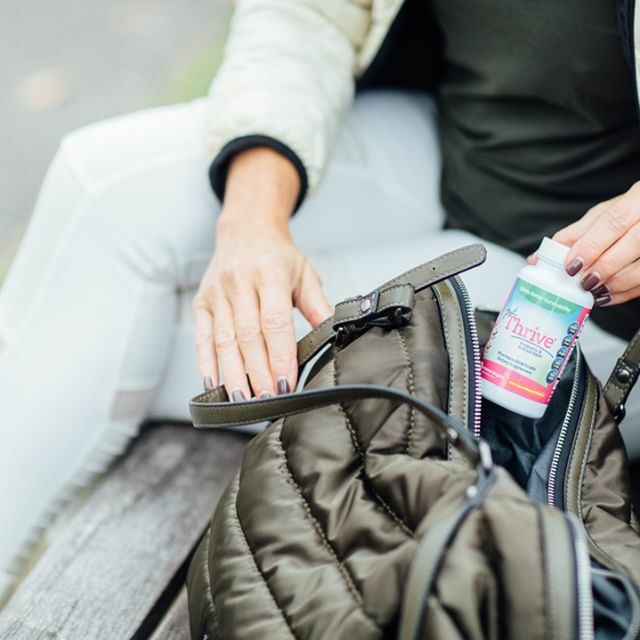 Learn More about Thrive Probiotics, and use the code KETOINTHECITY for 10% off your entire purchase! Also did you know you can use Just Thrive probiotics in recipes!? Their strains are SO strong that you can cook AND bake with them-- up to 455 degrees!! Here's a recipe for a Spicy Chocolate Fat Bomb with Probiotic Goodness Added in. 1. In a small skillet, melt the coconut butter, coconut oil, and butter or ghee over low heat. Once melted, add the cacao powder, probiotic, vanilla, cayenne, cinnamon, erythritol (if using) and pinch of salt. 2. Pour the mixture into the ice cube trays or silicone molds. Add slivered almonds or chopped nuts of choice on top. 3. Freeze for 30 minutes, then unmold the bombs. Store in an airtight container in the freezer or refrigerator. Get 2lbs of breakfast Sausage and 2 packs of Bacon for free with your first order of Butcher Box before April 30th. Butcher Box offers grass-fed and grass-finished beef, free range organic chicken, heritage breed pork, wild-caught Alaskan sockeye salmon and more. They are a subscription-based meat delivery company. Every month they curate boxes of the highest quality meat and send it right to your door. Until the end of April, They are giving every new subscriber THE ULTIMATE BREAKFAST BUNDLE for free in their first box. That’s two pounds of breakfast sausage and 2 packs of bacon! Butcher Box Bacon: ButcherBox Bacon is uncured, free of sugar and nitrates, non-GMO verified, hormone free, made from pasture raised heritage breed pigs AND its DELICIOUS! Butcher Box Breakfast Sausage: ButcherBox Breakfast Sausage is made from pasture-raised heritage breed pigs. It’s simply seasoned with salt, pepper, and sage. No added sugar. A delightful, protein-rich way to start the day! Choose from one of the pre-curated Butcher boxes or design your own (I promise you can’t go wrong) and get this 25 dollar value free. The Ultimate Breakfast Bundle includes 2 pounds perfectly spice breakfast sausage, ground and ready to prepare however you like and 2 packs of Butcher Boxes famous bacon! Don’t wait! This offer is only good until April 30th! Who doesn’t love Taco Tuesday or really tacos any day of the week?! Cheese shells make keto-friendly tacos super fun and easy. It’s super quick to prep all of the ingredients and then my daughter Kaia and I have so much fun constructing our tacos. We both like our tacos a little different so I prep a variety of fillings and toppings for us to choose from. Sometimes I just make one variety of tacos, but last Taco Tuesday, I made 3 different kinds! The breakfast and cheeseburger taco recipes are featured in my second cookbook, The Big Book of Keto. The cheese shells are the same kind of idea as the cheese chips I often make for cheese chips and quac, but with a bigger piles of cheese. 1/3 cup of blended Mexican Cheese for Each Taco Shell you want to make. Add 1/3-cup mounds of shredded cheese to the pan, leaving plenty of space between them. Bake until the edges are brown and the middle of each has fully melted, about 7 minutes. Set the pan a the cooking rack. Quickly, Bend the shells into a taco shape. I like to use the edge or a storage container lined with parchment paper. You can get creative with what you want to bend them over. As they cool, they will harden. In a skillet, heat the butter over medium heat. Whisk in the eggs and heavy cream, and season with salt, pepper, and a little hot sauce. Fill the cheese shells with the scrambled eggs, bacon or chicken, and top with the avocado and cilantro. In a large skillet, heat the olive oil over medium-high heat. Add the ground beef and onion, and season with salt and pepper. Cook for 6 minutes, stirring regularly, until fully cooked. Construct you tacos! Take a fully cooled taco shell and go crazy. In traditional Tacos, I like lettuce, cheese, and halved grape tomatoes and hot sauce. 1 tablespoon avocado oil mayonnaise, I like Primal Kitchen. Construct you tacos! Take a fully cooled taco shell and go crazy. For the Cheeseburger Tacos, Stuff the cheese shells with the beef, shredded lettuce, mayonnaise, mustard, and pickle slices. Get these recipes and 200 more in The Big Book of Keto, now available on Amazon! Life is just better with cookies isn’t it?! Here’s my favorite recipe for puffy, chewy chocolate chip cookies. You can use any keto-friendly chocolate chip or chunks of super dark chocolate. You can also add nuts if you would like, chopped macadamia nuts are my favorite! 2. Line a baking sheet with parchment paper or silicone baking mat and set aside. 3. In a saucepan or in the microwave, melt the butter. Place in a room-temperature container and let it set in the refrigerator for 10 minutes to cool down. 4. In a large bowl, combine the almond flour, salt, erythritol, and cream of tartar. Stir to combine. 5. In a small bowl, combine the egg, vanilla, and cooled butter. Whisk together. 6. Pour the wet ingredients into the dry ingredients and combine everything together with a large spoon or rubber scraper, then fold in the chocolate chips. 7. Scoop out 2 to 3” mounds of cookie dough and place on the prepared baking sheet. I like to flatten mine a bit. 8. Bake the cookies for 10 to 12 minutes before transferring them to a cooling rack for an additional 15 minutes. 9. These will make puffy chocolate chip cookies with a chewy center. I absolutely love them cold, so I generally store in the refrigerator. ATTENTION: I might have a new favorite way to eat my famous Pancake Cake! As most of you know, we are obsessed with Keto Pancakes at our house. Recently I came up with the idea to use my Pancake Cake recipe from my Easy 5-Ingredient Ketogenic Diet Cookbook and bake them in one of those brownie pans that makes the individual brownies so that each one has a perfect crust around it. It worked perfectly! It makes these beautiful, individual servings of pancake bites and it also makes it super easy to include add-ins like berries, keto friendly chocolate chips or anything else you can imagine! You’ll definitely want to make these for your next brunch or big family breakfast because each kid could get their own unique flavor! Look how beautiful these bite sized morsels turned out! These brownie pans also make perfect little cakes, they rise up and bake nicely all the way through. Preheat the oven to 425°F. Grease the brownie tin well. Blend the eggs, cream cheese, coconut flour, baking powder and stevia until smooth. Add the cooled melted butter to the batter. Bake for about 12-15 minutes, or until a paring knife stuck into comes out clean. Place the cake on a cooling rack, and melt a few more tablespoons of butter on top if you wish. Serve up with some Choc Zero Syrup and Butter. Get this recipe and more in The Easy 5-Ingredient Ketogenic Diet Cookbook, available on Amazon. I recently put together a big All Things Keto Pancakes Post with a bunch of ways to enjoy Keto Pancakes, so if you’re a pancake addict like me you’ll want to check it out! This Bacon Strawberry Spinach Salad is one of my favorite spring salads right now. The strawberries this season are incredible, and they pair beautifully with salty crispy bacon. (Strawberries are keto-approved as long as you don’t go crazy) I like to add avocado chunks to this salad, but you can add feta or goat cheese or even cheddar. This Recipe is featured in my cookbook, The Big Book of Keto. 1. Cook the Bacon on both sides until crispy in a large skillet over medium-high heat, about 8 minutes. Transfer to a paper towel–lined plate to drain and cool, then crumble it. 2. 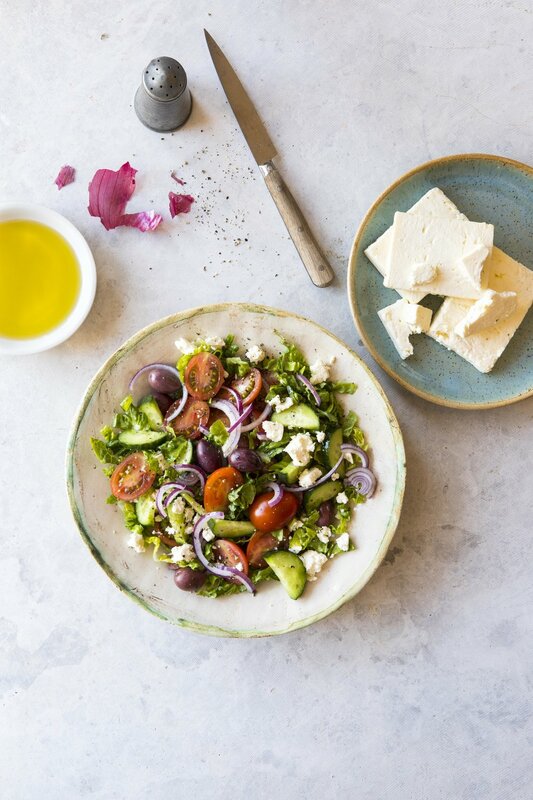 Whisk together the olive oil and lemon juice in a small bowl. 3. Toss salad ingredients in a large bowl. Add salt and pepper.